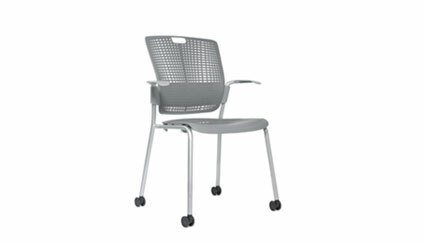 The unique Cinto stacking chair comes with glides, casters, sled base, with or without arms and 10 combination polypropylene finish options. The Cinto stacking chair holds a weight capacity of up to 300lbs. This is a very comfortable chair. Cinto from Humanscale stacks up to 15 high on the optional Cinto Dolly. The Cinto Stacking chair works in any work or home environment such as home offices, training rooms, cafeteria’s, educational institutions and medical institutions to name a few. This stacker is low maintenance and is washable with soap and water. This is one of the few stacking chairs that is actually comfortable.